HomeCould Plastic-Eating Worms Help Solve Our Waste Problem? As the world’s population is increasing, each year about 300 million metric tons of plastic is being generated, with more than half this number polluting the environment, specifically our oceans, by improper disposal systems and the large amounts of non-biodegradable items in it. Galleria mellonella, also called the honeycomb moth, is a pest to bees and certain crops. But now, scientists have established an essential function of this parasite in the area of plastic waste management. 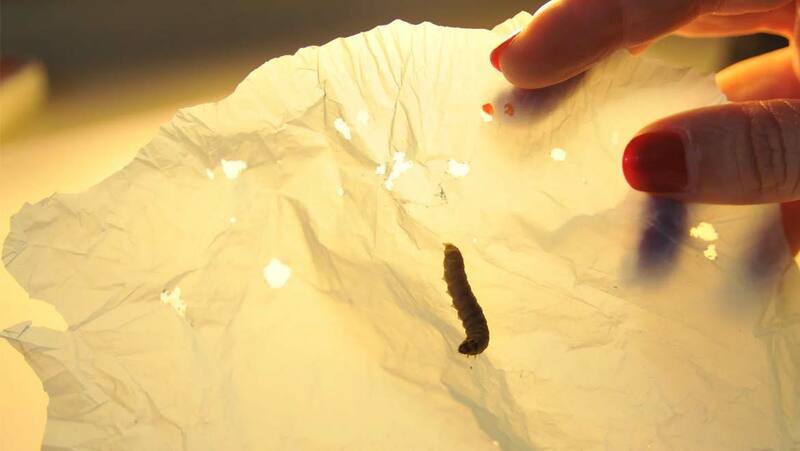 A study, led by researcher, Federica Bertocchini, and other scientists at the Spanish National Research Council and the University of Cambridge, has revealed that the larvae of this greater wax moth cherishes an interesting food habit — its voracious appetite for plastic! It is estimated that approximately a hundred of these worms can eat 92 mg of polythene in just half a day, which is great news for our plastic-infested landfills and water bodies. A renowned microbiologist at the University of Tennessee, Jennifer DeBruyn, mentioned that the surprising element in this case was not really the ability of an organism to degrade polythene, but the speed at which it does so. Beekeeper Bertocchini noticed that her beehives were infested with worms. She removed and placed them separately in a plastic bag and on returning to the room a few hours later, saw that not only were the half-inch wax moths everywhere, but also there were holes in the bag where they were stored. A consecutive experiment conducted by a biochemist at Cambridge, Paolo Bombelli, proved that this species was indeed ingesting the plastic and not just shredding it into pieces. This freak incident gave scientists and conservationists an idea, and the application of these Lepidopteran insects in waste degradation and cleanup of plastics was suggested. The moths’ mechanism? It is believed that they break down the polymers of polyethylene using the same enzymes that they use for the beeswax. Some studies even suspect that microbes in the insects’ guts could be responsible. Research is being conducted to identify these natural catalysts and incorporate these into microorganisms for testing in order to improve conservation and garbage management efforts. There are still some unanswered questions about exactly why these insects do what they do. Bombelli said, “We want to know if they’re munching the plastic to use as a food, or just because they want to escape. If they just want to escape, they are going to get fed up very soon. But if they’re munching it to use as an energy source it’s a completely different ball game. We are not yet able to answer this, but we’re working on it.” Experts are yet to figure out the bugs’ hunger levels, namely whether their appetite for plastic is insatiable, and the sustainability of such an operation if it comes through. It is estimated that the average individual uses more than 200 plastic bags in their lifetime, which could take more than 400 years to clear out of accumulated dumping sites or waterways. With the help of these plastic-ingesting worms, there is hope that the elimination of harmful, non-recyclable plastic can occur at a faster pace, and in the near future.